I like my stats. And I particularly like the usage of the ever more popular (and common) Expected Goals statistics. 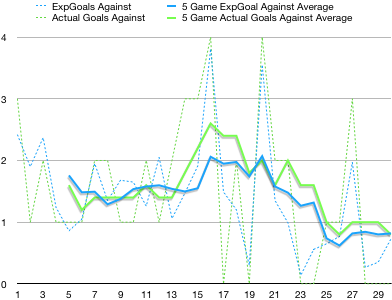 And a warning...if you don't like graphs...click Back now. Essentially, for every effort on goal, a number is given (actually a percentage) to indicate how good a chance that is. Lots of factors are taken into account, whether it's a header, a shot, an open net, a dead ball situation etc etc. As a crude rule, the teams who create a high Expected Goals number (and concede a low Expected Goal number) tend to be the better performing sides in the division. They can indicate trends, and whether runs of form are sustainable (more on that later), if teams genuinely are unfortunate or if a team is statistically punching above their weight. And using the InfoGol website, things are starting to look up for our rejuvenated side following the dismissal of Jos. 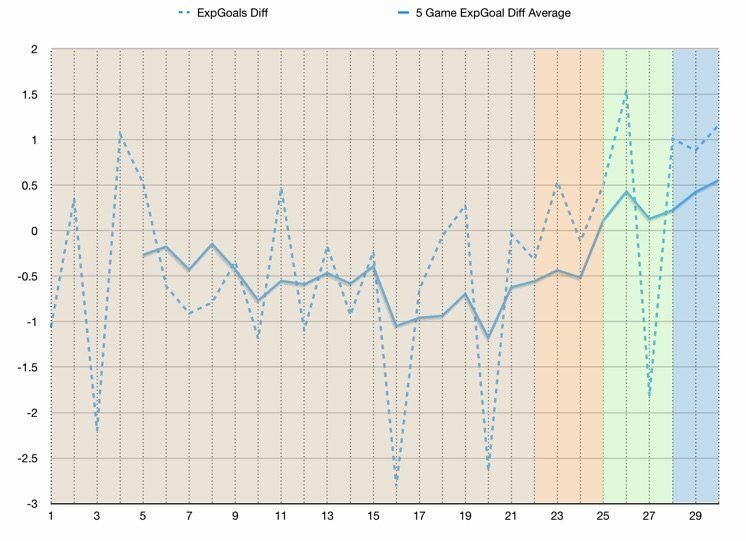 This graph shows the Expected Goals difference in each of our game weeks. Example, 1st game of the season, Wigan Away. Wigan created 2.42 xG, whilst we created 1.36 xG, therefore our xG Diff was -1.06. 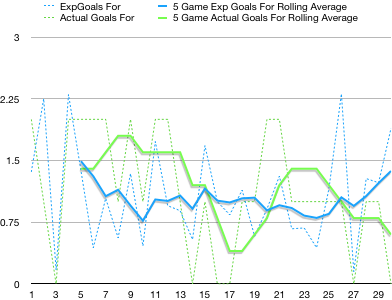 The Brown shading represents Jos' time here, Orange Bullen's, Green Agnew/Clemence's and finally Blue is Bruce's. As you can see, throughout Jos' period in charge we were constantly conceding better chances than we were creating. Even when we had the run which culminated in us sitting in the playoff positions, we were still performing to a negative xG difference. Indicating the run was unsustainable, and heavily reliant on good fortune (either underperforming opposition strikers, overperforming goalkeeping or overperforming in our own finishing...i.e. Reach's run of wonder strikes). Bullen began to change things for the better, although we only managed to outperform the opposition in one of his three games in charge. Agnew oversaw our best performance of the season...the 1-1 draw against Birmingham. We created a high xG in that game, and limited Birmingham to very little. In Bruce's 1st two games, granted against two of the league's worst sides, we've put in two dominant displays in terms of xG. For the 1st time this season, we've managed to maintain a positive 5 game average xG diff for a sustained period of time. Taking the Hull game as an anomaly, since game week 21 (Rotherham) we've seen a definite trending improvement. Essentially, what this indicates is, if we start to find our shooting boots and maintain the current levels of performance, our results will continue to improve. Our offensive xG has actually remained at a similar level throughout the season, between 0.75 and 1 for the most part. Indicating, on average, we're creating enough chances to score about a goal a game. What has changed, aside from a 5 game stretch between GW 15 and 19, is we are currently underperforming to our xG, whereas our over-performance earlier in the season we down to our ability to score goals from positions with a low xG. Prime examples are Reach's goals against Boro, Leeds and WBA or both goals away at Reading (combined xG of 0.09 resulted in a actual goal score of 2.0). But, without doubt, our biggest improvement since Jos' departure is our ability to prevent the opposition creating good quality chances. Almost instantly from the game week of Jos' departuure (GW22), our xG against numbers have nosedived. In only one game since Jos' departure have we conceded a xG of more than 1.0, against Hull, which is beginning to look more and more like an anomaly...an off day. Overall, there's reasons to remain positive. I'm certain Bruce will want us to start to ensuring we convert the chances we create. If we do so, and maintain our recent trend of conceding few good quality chances, results can only continue to improve. Well done mate. Onwards and upwards. Tell me Doctor, will I be here until Christmas? What you've got to realise is that all clubs will now have someone dedicated to generating stats like this. Very much part of the set up now. Basically Jos didn't have a clue. For that defensive improvement to happen immediately it proves Jos was utterly inept. And, the departure of Jos, coincided with the reintroduction of key defensive players Hutchinson and Westwood. Although, for the most part, Dawson outperformed the expected xG he should have conceded. Love it. Where did you get the data from? Luhakay was a Grade A Bulb. Am glad he's now back where he belongs growing prize marrows in his allotment. It's still on then. Goal fever for the run in. Saturday was a blip, we're goin on a jamboree. Any particular reason you chose brown shading for Jos's games? We are now creating more chances, but still not scoring enough. I'm not sure that we need the analysis to tell us that. It’s something I could easily confirm, when I get chance. But, just off the top of my head, the games against Norwich, Sheffield United (only as a result of the penalty) and Leeds all equates to a sizeable negative xG difference. The games against WBA, Derby, Boro, Villa not so much. In fact, in both games against WBA we out scored them in terms of xG. Interestingly, our win at Reading was statistically fortunate, and the game away at Wigan, a fully deserved defeat.